I checked last night and they have already drawn out one bar of comb to the floor and are working diligently on the other comb. I will add another hive box within two weeks…possibly sooner depending on how good the nectar flow is, how good the weather is and how strong the bee package will turn out to be. There are so many variables in a honeybee’s world! This entry was posted in Nick's Bees, Warre Hive and tagged beehive, honeybees, installing package bees, Top Bar Hive, Warre Hive. Bookmark the permalink. 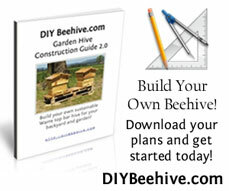 I’ve never kept bees, but have been reading/studying the topic over the last couple of years and plan to build some Warre Hives this winter to have ready for spring. Thanks for sharing your experience, I’ll follow your progress.